On 26th of October, we celebrated Charlie Boy's (Vicefriend) Birthday, Wendel called me up and he insisted to meet us including Maret and Charlie in SM Megamall. I think Wendel did not have that convincing power that day because Charlie did not show up and told him that he is shy because it was his birthday and maybe he was thinking that we were expecting a treat from him. It was Wendel's idea to celebrate Charlie's birthday that day but unfortunately, Charlie did not attend to his own birthday celebration. 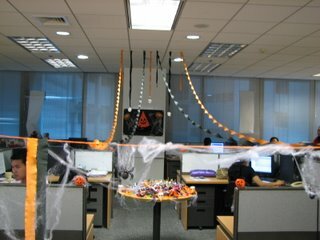 The next day, 27th of October, we had Halloween celebration in Misys Office, Trick or Treat. We decorated our area and it seems simple but nice. 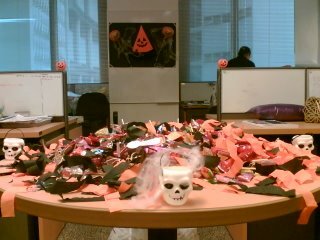 The girls from our team designed our workplace including the table that is full of candies. 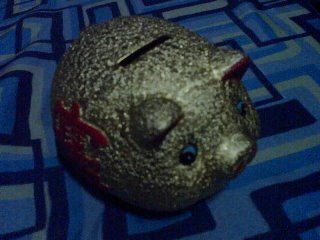 I have checked this piggy bank of mine, it was a gift from my bestfriend on my 22nd birthday. I realized that it was almost full but I am now afraid to broke this. 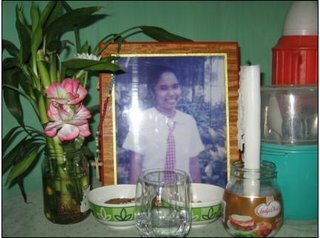 The reason is that it is full of 5 peso and 10 peso coins. I am afraid that I may discover fake peso coins. Since there was a report on manufacturing fake coins, haaaayyy... I always check my coins using magnet just to verify if it is fake or not. I have decided to open this on Noche Buena at ipapaagaw ko!!! Yipeeee!! !